Comfort Designs (CD) entered the senior living bathing fixture arena in the early nineties. It set out to become the bath choice of developers and designers and quickly became the leader, developing a wide array of code compliant and accessible showers and tub showers for both new construction and renovations. CD’s collections of models address every aspect of senior living including assisted, memory care, skilled nursing, and long term care. 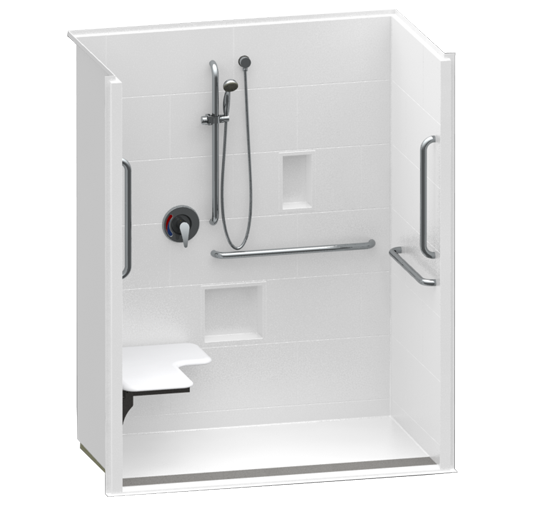 CD entered the healthcare arena with its patented one piece and multi-piece linear trench drain shower system, which has gained numerous hospital specifications. CD’s most recent collection, Asura, extends the linear trench technology to the senior living market. It has also pioneered the solid surface finish and the use of anti-microbial agents embedded in finished surfaces. The focus for CD engineers and marketing staff is bring the market beautiful, long lasting, easy to install, safe bathing fixtures which are compliant with all codes. CD promotes its One Source approach for healthcare and senior living which enable the developer and designer to stay within the CD line for every need.